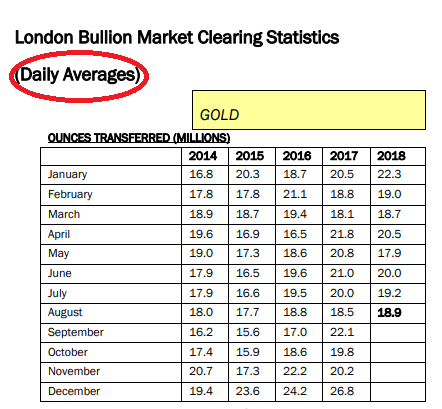 The first day of each month sees the reporting of a number of statistics about the London Gold Market by the bullion bank led London Bullion Market Association (LBMA). These statistics focus on clearing data and vault holdings data and are reported in a 1 month lag basis for clearing activity and a 3 month lag basis for vault holdings data. Therefore the latest clearing data just published is for the month of August, while the latest vault holdings data is for the end of June. "The physical holdings of precious metals held in the London vaults underpin the gross daily trading and net clearing in London. The net clearing is undertaken by the members of the London Precious Metals Clearing Limited (LPMCL)." Although in both cases the data reported lacks any granularity and are just rolled up numbers, the two sets of statistics are useful in that they highlight the clear contradiction that exists between the huge volumes of fractionally-backed paper trading in the London Gold Market, and the relatively small quantities of underlying physical gold that sit in the gold vaults of the same institutions engaged in this 'gold' trading, quantities which are even smaller when Bank of England and ETF gold holdings are excluded. 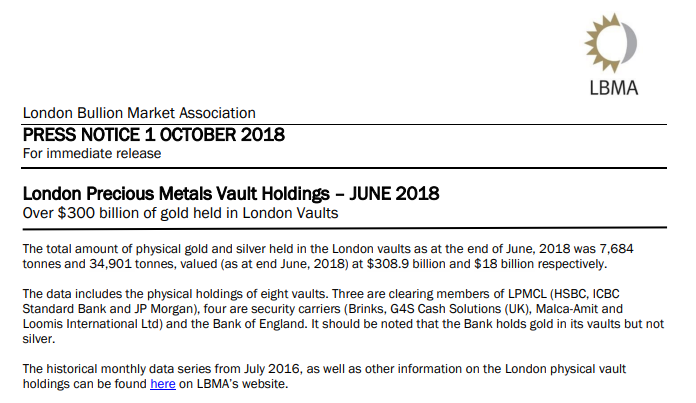 Looking at vault data first, at the end of June the LBMA reported that there were 7,684 tonnes of gold held in the eight vaults comprising the LBMA vault system in London. Three of these vaults are owned by clearing members of London Precious Metals Clearing Limited (LPMCL) i.e. HSBC, JP Morgan and ICBC Standard Bank, four further vaults are operated by the security carriers Brinks, Malca-Amit, Loomis and G4S, and the final vault area (which only holds gold) is operated by the Bank of England. While 7,684 tonnes may seem like a significant amount of gold, much of this gold is held in custody by the Bank of England for its central bank clients, and another large chuck is held in LBMA vaults in London as backing for commercial gold-backed ETFs such as the SPDR Gold Trust. Therefore, these two categories of gold are generally speaking not 'available' for use by bullion banks as this gold is owned by other entities (disregarding central bank gold lending and raids on ETFs by bullion banks). Backing out gold custodied at the Bank of England and gold held by ETFs which store their gold in London leaves a far lower figure. Each month the Bank of England publishes data on the total quantity of gold held in its vaults, having also started publication of this information in 2017, a few months before the LBMA. At the end of June this year, the Bank of England reports that there were 5,179 tonnes of gold held in its vaults. Subtracting this Bank of England gold from the LBMA figure of 7684 tonnes yields 2,505 tonnes of gold in the other seven LBMA vaults combined. 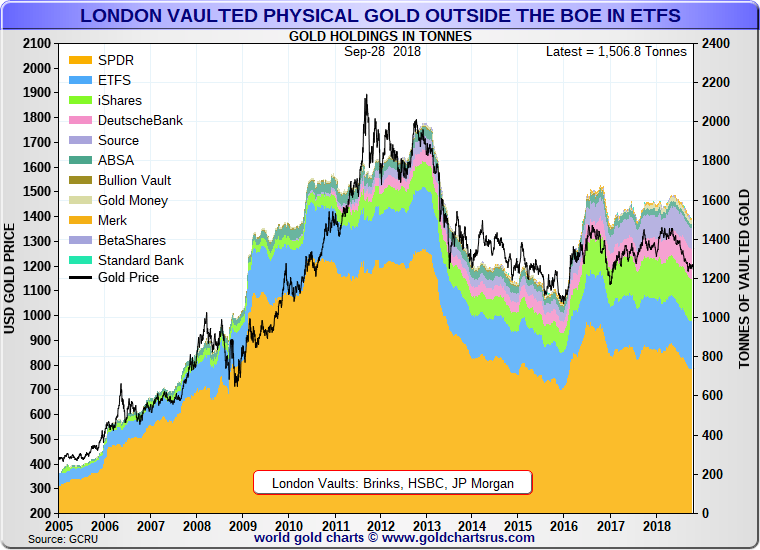 Next, we have to exclude gold held in LBMA London vaults that belongs to ETFs such as those operated by ETF Securities, iShares, the SPDR Gold Trust (GLD), and Source. The latest figure for the combined London gold holdings of such ETF vehicles is 1507 tonnes, according to an excellent chart which is maintained and calculated on the GoldChartsRUs website, Subtracting 1507 tonnes from the 2505 tonne figure (LBMA - Bank of England) gives a final figure of just 998 tonnes of gold. There are therefore just shy of 1,000 tonnes of gold in the LBMA London vaults that are not at the Bank of England or that are not earmarked for gold-backed ETFs, and importantly, this gold, as the LBMA stated itself is 'underpinning' the 'gross daily trading and net clearing in London'. "the clearing statistics represent the net volume of loco London gold transfers settled between the five clearing members of the LPMCL." During August, there were 18.9 million ounces (equivalent to 588 tonnes) of 'gold' cleared by the LPMCL. Yes, that's a 'Daily Average' figure as reported by the LBMA. This figure is just for clearing volumes, not trading volumes. Gold trading volumes are said to be, according to various LBMA trading surveys in the past, in the region of 10 to 1, or even higher. With 18.9 million ounces (588 tonnes) of 'gold' cleared each day during August, that would equate to 189 million ounces (5880 tonnes) 'traded' each day in the London Gold Market. We still don't know any exact trading volume data in the London market because the LBMA still hasn't published this data, despite having promised to do so for 4 years now, and being 'obligated' to do so by the Fair and Efficient Markets Review (FEMR). See here for details. But its get better. On a monthly basis, the London Gold Market looks to be trading about 130,000 tonnes of gold (assuming 22 trading days per month). On an annualised basis, the 189 million ounces (5880 tonnes) of gold traded each day in London (based on the August clearing figures and a 10 to 1 trading multiple) and assuming 250 trading days in a year, would imply that 47.25 billion ounces of gold are traded each year in the London OTC gold market, or 1.47 million tonnes of gold. However, there have only ever been about 190,000 tonnes of gold mined throughout history, with nearly half of that said to be in the form of gold jewellery, and only 38% held in central bank and private hoards. Therefore on a monthly basis, the London gold market looks to be trading about 68% of all the gold ever mined in the history of the world, and on an annual basis, the London gold market looks to be 'trading' more than 11 times the amount of gold ever in existence, even though nearly all of this above ground gold is never in fact traded at any given time. But it gets even more absurd. Recall from earlier in this article that as of the end of June, (the latest month for which LBMA vault and Bank of England vault gold holdings data are available), there were 7,684 tonnes in the LBMA vaults, 2505 tonnes in the LBMA vaults excluding the Bank of England vault holdings, and 998 tonnes in the LBMA vaults when excluding ETF gold holdings stored in London. And note that with LBMA and Bank of England vault holdings fairly static, these figures do not change much month to month. But each day in the London Gold Market, there are approximately 5880 tonnes of 'gold' traded. So the equivalent of 6 times more 'gold' than the maximum amount of physical gold that could possibly be underpinning trading is being 'traded' every day in London. On a monthly basis, the equivalent of 130 times more gold is being traded than is available as physical gold in the London vaults to underpin trading. And a whopping 1470 times more 'gold' is being traded each year in the London Gold Market than is available in physical form in the LBMA vaults in London to underpin trading. So what is going on? Enormous 'gold' trading volumes yet tiny vaulting volumes of real gold. How can that be? The answer is that in percentage terms, the London Gold Market does not trade very much real physical gold, or said another way, nearly all of the gold trading that goes on in London OTC gold market only has a tenuous connection to real gold. This is because at the heart of the London Gold Market lies the concept of 'unallocated gold' accounts and positions, where bullion banks use a fractional reserve bullion banking system to trade huge quantities of 'gold' that does not exist. 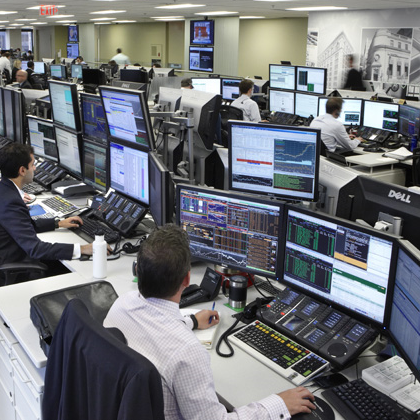 Where trading almost never results in physical delivery, where activity is just leveraged speculation against the US dollar gold price or 'screen gold', where more than 99% of transactions are in unallocated positions, and where positions are cash-settled. "the reality of unallocated bullion trading is that buyers and sellers rarely intend for physical delivery to ever take place. Unallocated bullion is used as a means to have “synthetic” holdings of gold and so obtain exposure to the price of gold by reference to the London gold fixing. But importantly, the London Gold Market, along with COMEX are the two most influential trading venues for gold price discovery and for establishing the international gold price, even though the trading in both venues is far removed from trading physical gold. So next time you see the LBMA release clearing data and vault holdings data, as it does at the beginning of every month, its worth picturing these two sets of data, not as two distinct datasets, but as two interrelated sets of data where a tiny amount of physical gold in London vaults, 'underpins' vast amounts of trading in fictional 'gold', and where mainstream financial journalists fear to tread or ask questions as to how this Ponzi scheme came into existence and has been allowed to go on for so long. This article originally appeared on the BullionStar.com website under the same title "LBMA Clearing and Vaulting data reveal the absurdity of the London 'Gold' Market".